We are excited to be presenting our first concert with a percussionist! Over a year ago we got an email from this guy introducing himself. We checked out his youtube channel and were impressed, so we working him into this really fantastic program. In fact, he has a piece all to himself! The way my mom tells it, my musical career started when I was 2 years old. We'd be visiting my grandparents, and I would climb up to the piano and plunk out melodies that I had heard on the stereo or just make up my own melodies. I got started on piano lessons a couple of years later, but was always looking forward to the 4th grade, when we got to start participating in band. I always knew I wanted to play percussion - in fact, it was completely amazing to me that some people DIDN'T want to play percussion. Once I started, there was no looking back. When it came time to start thinking of careers and college majors, I couldn't imagine myself doing anything other than music. Nothing else seemed right. Jeff with some of his "toys". I got my degree in music education from Penn State University, but didn't quite feel ready to enter the work force - I wanted to really hone my skills as a performer. So I resumed my studies at the University of Michigan, earning my master's degree in percussion performance. After graduating, I returned to my home state of New Jersey to start my teaching career. 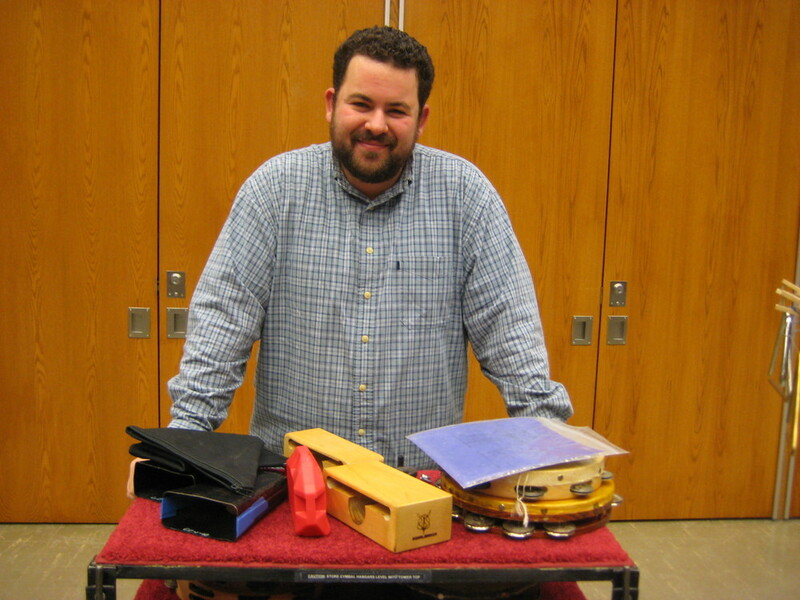 For three years, I worked as an elementary school band director and district percussion specialist. I had a great time doing it, but rather quickly realized that this was not my life's calling - I wanted to work with college students, those who have made the decision to dedicate their lives to music. So I returned to Ann Arbor and graduated with my DMA, also in percussion performance. Upon graduating, I was fortunate enough to find employment at Lindenwood University. Just one of the instruments Jeff will be performing on with us. This is a marimba. Working at LU has been fantastic - my students and colleagues are great, and I am totally justified in choosing this career path. I am currently the Director of Percussion Studies at the St. Charles campus, and the Director of Bands at the Belleville campus. I am thrilled to be playing with Chamber Project STL - chamber music has always been a very important part of my musical education and career, and being able to continue that with this group means a lot to me. The 'Weave' program features great music (although I am partial to Reich's Vermont Counterpoint, my solo debut with the group! ), and I'm sure you'll love it as much as we do. Thanks for supporting Chamber Project STL and the arts! Please visit my website at www.jeffreybarudin.com and my YouTube channel at www.youtube.com/user/JeffBarudin to see my videos and learn more about me. Meet Jeff at our Very Open Rehearsal on Jan 9 and hear him perform Jan 17 and 29th. Check out our concerts page for details. What in the world is AUGENMUSIK?